I have a problem with 13th floor ticket to Naksun. According to the 2nd image you haven't completed Enter the Dragon Portal. That could be the reason why you can't use the ticket. Was you able to use the ticket before? You have to talk with Jakdan the worldly first, he's in the same room with chungsil, the lyn in your image. Then you have to manually climb from floor 9 to 13, you don't need to clear floor 13, just reach it. After that talk to Jakdan again and you'll complete the quest and the tickets will work. >you don't need to clear floor 13, just reach it. how can i reach the floor 13?, when the door is still closed. 13th floor ticket doesnt work, the game doesnt let you. this is wierd. it is like.. 9th to 13th bosses are a whole package. Exactly you can not skip to floor 13 if you have not cleared 9-12 at least because if you can't clear those floors you will not be able to clear 13-15, its a dps check to make sure you actually know what you're doing. What you have to do to reach floor 13 the first time is work your way up. >>Exactly you can not skip to floor 13 if you have not cleared 9-12 at least because..
you really need to read the post carefully. i can go to the 16th floor, even when i havent done the 13th 14 th 15th. >>Exactly you can not skip to floor 13 if you have not cleared 9-12 at least because if you can't clear those floors you will not be able to clear 13-15, its >>a dps check to make sure you actually know what you're doing. otherwise, the game wouldnt have let me go to 16th floor, when i havent done the previous floors. because of this, i was searching the 13th floor, door to door, portal to portal, making me think that there might be a portal somewhere. because "13th floor ticket" clearly indicates that i can go to 13th floor. if i have to do 9 10 11 12th again, by the time i get to the 13th floor, my hand and arm start to shake, then i think about resting and not wining the 13th floor boss. and no it is not important for a noobie to skip to floor 13 it is important for a noobie to learn how to get through those floors and get stronger. 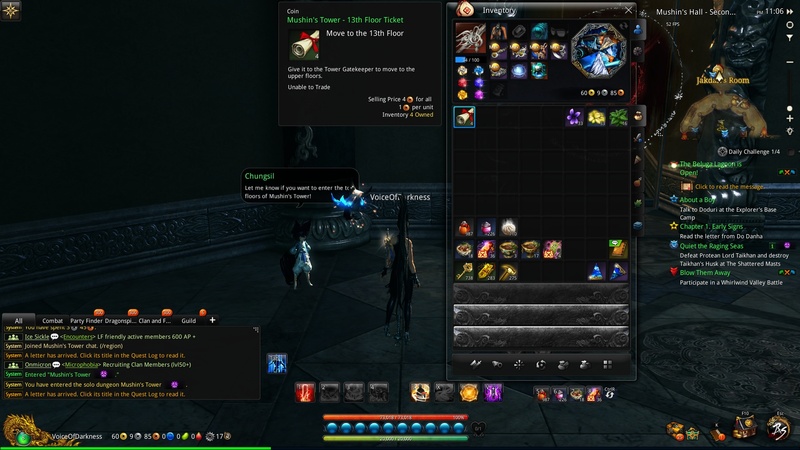 Mushin's tower is meant to be a challenge and to be difficult. we all had to do that and go through it, its really not that hard and if you are struggling that bad then get stronger because its just going to get more difficult. The reason why the op couldn't use his tickets is because he didn't complete a quest he was supposed to do to be able to skip floors. >>13th floor ticket doesnt work, the game doesnt let you. >>it is like.. 9th to 13th bosses are a whole package. fine, however, what is the point giving me the 13 floor ticket to misguide me, making me thinking that i can go to 13th floor later directly. the game didnt give me the 9th floor ticket,10th floor ticket, 11th floor ticket, 12th floor ticket, so that i had to keep going up. >The reason why the op couldn't use his tickets is because he didn't complete a quest he was supposed to do to be able to skip floors. who is op? the original player who posted this thread? CastielWinchester? if 9th- 15 th were a whole package deal, then it was obvious the playerCastielWinchester didnt complete, and neither did i, turned out to be as you indicated. if someone asks you to kill the15th floor boss, do you(you as in the one who did all 20 floors + if any more ) also start from 9th floor? all i need is yes or no at this point. and get rid of that "floor ticket" not to misguide people like me and CastielWinchester and many other players you could find in the google, mentioning the same thing. give us the package ticket, grouped floor ticket or whatever. CAN use the 13th floor tickets to bypass 9-12. The reason you can't use them is quest related. 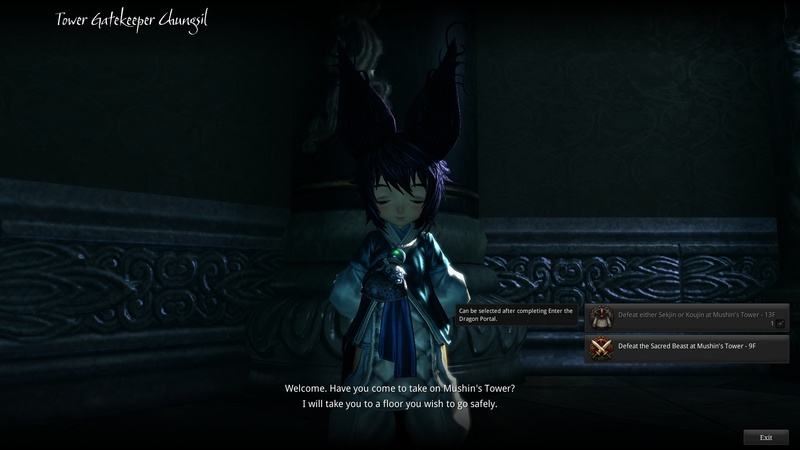 You have to go to mushins 2nd floor (not the solo dungeon, the actual tower), accept the quest, clear floors up to 13, and then turn in the quest. Once you do this the tickets are usuable. I don't remember the quest giver but it's on the 2nd floor of mushins tower. The name is Podan or jakdan or something like that.